Specialist Coatings GB Ltd Heating fuel oil and chemical resistant bund lining. 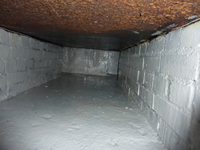 Secondary containment bund lining and rebar damage concrete repairs for school boiler heating oil bulk fuel tanks. 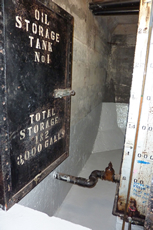 The school’s heating boilers were located in an underground room and bulk heating oil tanks that supplied the boilers were located in two separate sealed chambers adjacent to the boilers. 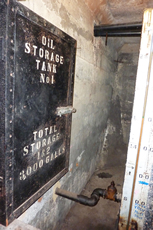 The boiler room was probably constructed when the school was built, approximately 1940’s, and one chamber particularly had been deteriorating due to rebar corrosion and damage to the concrete. There was considerable concrete debris on and around both tanks. One of the bunds was in a worse condition than the other bund because of long term water ingress through a leaking roof hatch cover. Over the years various electrical service cables had been added. During the installation of these cables the external wall of the sealed bunded area had been breached and in the event of a serious oil leak or spill the oil would have entered the main boiler room. Because each room was self-contained and separated by a solid concrete wall it was required that we were to create an opening to link the two rooms to enable better control in the event of an incident. The working area around each the tank was constricted, there being only a small space between the tank and the chamber wall and also under each tank. After we marked the height line around the perimeter of each room to define the agreed area that we were to treating up to. 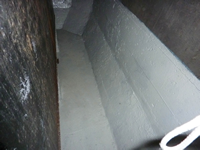 We prepared the surface, by abrading and scraping off any loose and flaking debris from the walls and floor of each chamber. During this work several large areas of loose concrete fell away from the walls. This resulted in a solid surface with some large craters, none of which were a problem to our liquid and paste resin based concrete repair system. The exposed steel was cleaned and best possible and treated with a two-pack solvent free epoxy primer coat. The deep craters and holes were filled with a paste/mortar mix to strengthen the existing concrete. The thicker paste is used to even up some uneven areas. After a suitable hardening time we applied two/three coats of the chemical and fuel oil resistant two-pack epoxy resin coating applied by roller and brush to protect and seal the two bunded areas. Into the final coat on the floor of each bund we added anti-slip particles to the resin for the safety of personnel working in the chambers. Fortunately the chambers were completely dry had they not have been dry then we still could still have treated them. We would have used our moisture and wet surface tolerant epoxy resin primer, this has proved to be very useful when working on damp, wet or green concrete surfaces which otherwise could not have been treated. The bricks on which the tank stood were awkward to access due to the restricted area around the tank. 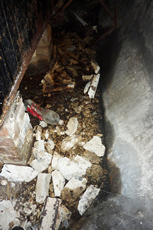 In the second chamber we were given the additional task of repairing damaged concrete roof beams. The process acquired three consecutive days for each chamber for us to build up and complete our bund lining system. Our client had peace of mind that in the event of an incident with one of the heating oil tanks, the fuel would be contained and the heating oil recoverable. We left site clean, tidy, on time and on budget.